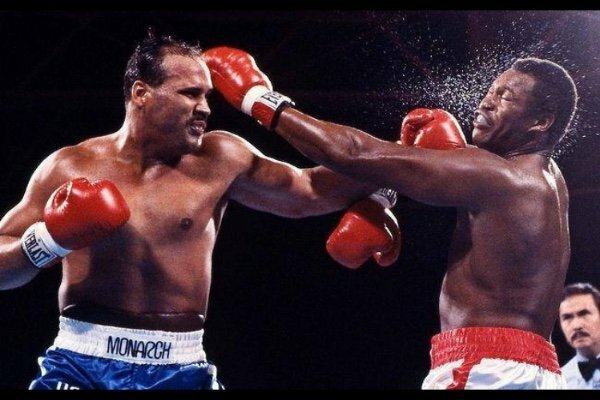 David Bey (left) lands a punch on Larry Holmes (right) in 1985 IBF championship bout. Former heavyweight boxer David Bey, a Philadelphia native who famously went 10 rounds in a losing effort against IBF champ Larry Holmes, tragically died last week in an industrial accident in Camden, according to the Occupational Safety & Health Administration. The 60-year-old pile driver, a second generation worker who rose through amateur boxing ranks, was fatally struck last Thursday by a piece of metal while working on a real estate development in Camden, ESPN reported on Tuesday. Bey, an Army veteran who trained to box while in the military, spent 37 years in his trade and was joined by his two brothers in construction work. With his professional boxing debut in 1981, Bey defeated James "Buster" Douglas and began an improbable run that saw him tally a 14-0 record. His decisive victory over Greg Page for the USBA Heavyweight championship set up his admirable bout with Holmes. Nicknamed the "Hand Grenade," Bey was inducted into the Pennsylvania Boxing Hall of Fame earlier this year. A GoFundMe page has been established to create a memorial fund in Bey's honor.